NEW MULTI-USE KITCHEN SET- Fruit Slicer, Watermelon, Cantaloupe, watermelon cutter, corer, cake, melon baller. 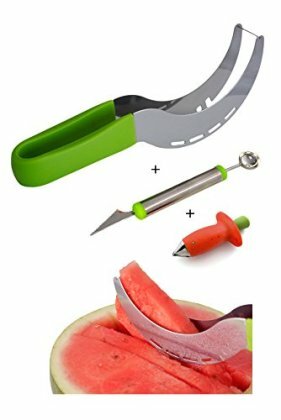 NEW LONG FRUIT SLICER - 2.3 cm longer than normal slicer, This watermelon slicer is super easy to use and the results are really neat, with this you can be have the whole fruit sliced very quickly. NEW SMART KITCHEN TOOLS. Melon ballers, Fruit Carving Tools 2-in-1. Picking up the core of melon, watermelon, apple, etc, on the other hand carve them in special shape. NEW HIGH QUALITY MATERIAL - SS430 Stainless steel structure, won't rust, clean and durable. easy to clean, dishwasher safe.